I will be showing some new work starting Friday night, at Screen Ink. It’s a duo show with “eyeskull.” Sounds like it will be a pretty interesting show! 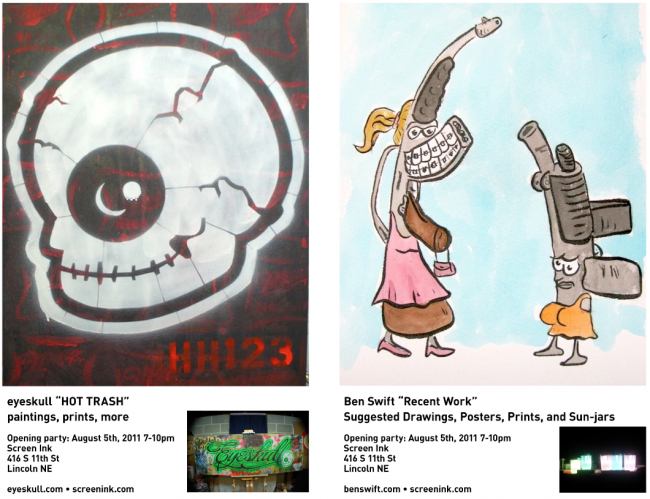 Artists Ben Swift and �eyeskull� will be opening their duo show at Screen Ink on August 5th. The show will run through August. Swift will be showing recent work from the past year, including pieces from his �Suggested Drawings� illustation series, screen-printed posters and art prints, and Sun- Jars; solar powered mason jars. Individual pieces will be for sale, as well as signed and numbered editions of the posters and art prints. �eyeskull� will be showing recent works on canvas and paper, including several large pieces and a variety of smaller works. Many of the pieces are graffiti or �street-art� inspired pieces using stencils and mixed media to create depth. �eyeskull� will also have designs to be printed live on a garment of your choice, or purchsed at Screen Ink. and a variety of stickers and other goods for purchase.